Initial Fee - $25 000 per unit. 3-month payment by installments available. Contact us to find out more. Special terms for partners outrunning the development schedule. Contact company’s representative for details). Our team consists 100% of those, who started their career in Papa John's more than five years ago with junior positions. They have reached the peak of their business career, climbing the corporate ladder from the very beginning, and now they are able to meet any challenge. We are the first to introduce new technologies to the market. Usage of Apple Pay, self-service terminals for pizza places, food trucks are just few examples of our innovations. 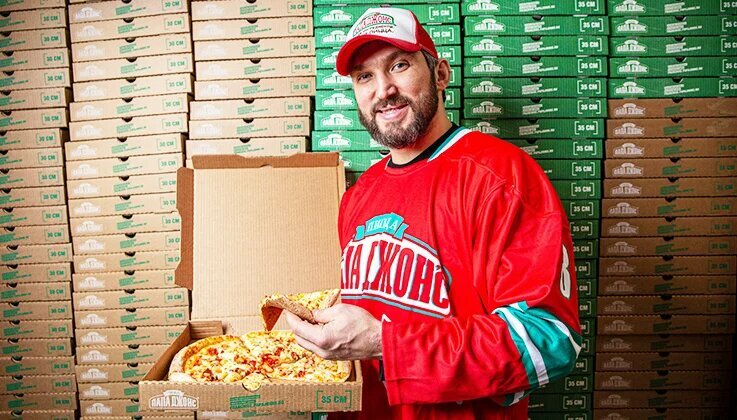 The legendary hockey-player Alexander Ovechkin – Papa John’s Partner in Russia. His popularity and image improve brand awareness and contribute to the increase of the number of orders.